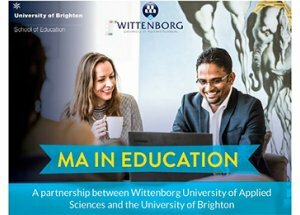 On 28 March Wittenborg will host a Symposium on its new Master of Arts in Education, featuring academic experts from both the UK and the Netherlands. Attendees can register here. The MA in Education is due to start in the autumn of 2019. 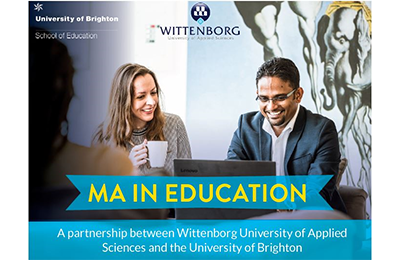 It will be offered jointly by Wittenborg and the University of Brighton in the UK. It is aimed at educators and experts who wish to further their professional development and feel inspired to study within the context of an international environment. 15.35-15.55: Keynote lecture - Prof Dr Ronald Tuninga (WUAS): "Quality development by further education"
15.55-16.15: Lecture - Dr Marlon Moncrieffe (UoB): "Cross-cultural education and own education"
16.15-17.30 Workshops Master of Arts in Education - Dr Soo Sturrock and Dr Alison Barnes (UoB): "Research-literate practitioners: the place of MA Education in continuing professional development"